SEGA Japan’s music division Wave Master International have finally struck a deal with a European label to distribute SEGA soundtracks in the West. Wayo Records are working in collaboration with Wave Master and their first release with them is a 3CD soundtrack for Sonic Forces called ‘A Hero Will Rise’. This soundtrack contains the same content as SEGA Japan’s ‘A Hero Will Rise’ soundtrack and there’s currently no plans to release the now Japan exclusive, Sonic Forces Vocal Traxx: On The Edge CD. The soundtrack can be ordered directly from Wayo Records’s store for €25.00 and the label ships worldwide. The soundtrack also comes with a bonus sticker and poster. 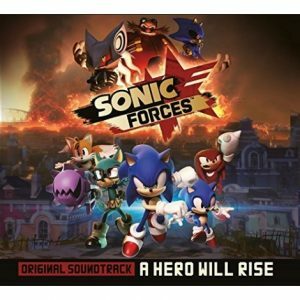 Click here to go to Wayo Records’s online store and order Sonic Forces Original Soundtrack: A Hero Will Rise. This entry was posted on Tuesday, April 3rd, 2018 at 15:50	and is filed under Merchandise. You can follow any responses to this entry through the RSS 2.0 feed. Both comments and pings are currently closed.